In the imaginative act, we are grasped whole. Revelation is not a matter of thinking or feeling, intuiting or sensing, working from the left side of the brain or the right. It is a shocking gift of new sight that obliterates such distinctions, grabbing us by our lapels and turning us around, so that when we are set back down again we see everything from a new angle. We reason differently, feel differently, act differently. Imagination does more than affect us; it effects change in our lives. Barbara Brown Taylor, The Preaching Life (Lanham: Cowley, 1983), 48. How to cultivate imagination for prospective preachers? How do I, as someone whose imaginative life is fed as much by novels and poetry and music as well as film and TV, help those who don't read that stuff? Once, in a meeting of seminary teachers on the subject of spirituality within the curriculum, a tutor from the Baptist seminary in Cuba stated that he felt that his calling and that of his institution was to help his students (prospective pastors and preachers) to 'appreciate beauty' - what would it look like if we took such a calling seriously? Some because they can't make detailed notes when they don't have a 3 point, logically structured propositional sermon. How do you make notes on being asked how you feel about Jesus from the woman taken in adultery's point of view? (or then there was the bloke who said he couldn't tell because he wasn't a woman and spent the whole discussion time arguing with his mate about one of the footnotes). Some because they want a clear statement of which doctrine this illustrates, not metaphor and allusion to set them sparking off on a creative search for meaning. Some because they want practical applications, not exegetical points or observations on the text. Some because they've never encountered the passage before and just want to know what it's basically about. I'm reading bits here and there by Leslie Francis on personality type and scripture and finding his suggested solutions to preaching a bit crude and formulaic, but recognising that different people do have different cognitive and affective preferences; some of them may value imagination over action points, others may value doctrine over feeling. Others are more complicated! Is this part of the mix as well, or is Myers Briggs really off the point? I love the quotation on revelation cutting through the whole left brain right brain thing. But I wonder how much it is feasible, let alone legitimate, to try to define what might inspire/excite people to imagination/creativity etc etc. How is 'beauty' to be defined? I quite like mathematical formulae and sometimes find them beautiful - but I doubt many people would (though RLK might)... At the same time, a lot of art does nothing for me, though I can delight in other people's delighting. I think there is also something about what we mean by creativity - which might be expressed artistically, musically, verbally or just about anythingically I suspect. One of the dangers, I think, is that we all tend to think we are normative, and we aren't. The trick, I suppose, is to help people to find the key to unlock their own ways into imagination/creativity. How to do that without alienating people for whom this is different I'm not sure, other than by creating a culture of mutual respect. Sorry, I'm waffling (as ever). Fascinating post and made me think. 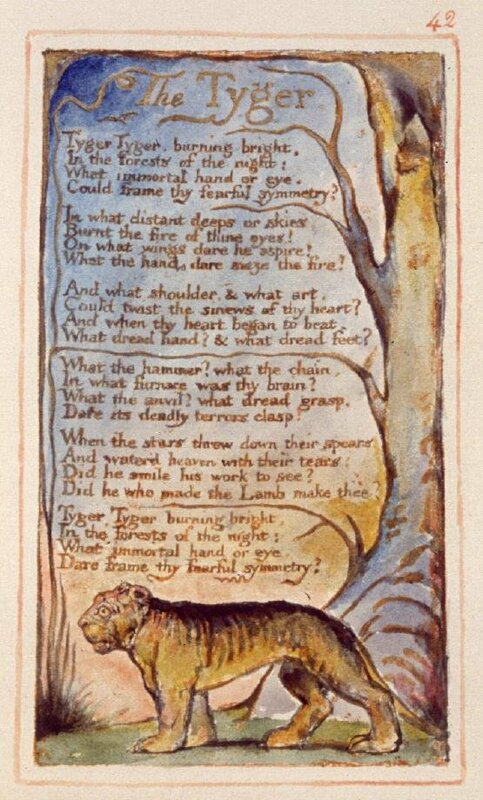 That and "The Tyger" is an old favourite, if only because I like tigers! A few sets of Irenaean meditation as part of our scriptural work out might help. Some sessions on films wot made me excited maybe. Some time sharing music that sends me into ecstasy perhaps.